Consumers are frustrated that the tap water they drink is not as clean or pure as they expect it to be. Buying bottled water is a poor answer. The plastic bottles and lids build up in an environment already over-burdened with rubbish. People resent having to pay for water when it is the most plentiful resource around the globe, and bottled water is certainly expensive, especially for those already paying a yearly tax for the provision of treated water. What’s Wrong with City Water? Why can’t they just enjoy water from their household taps without ingesting poisons? Chemicals remove bacteria to protect consumers but they introduce toxins into people’s bodies. Many people use a filtered container to purify tap water and these work to some extent, but exciting new technology from Clearly Filtered exposes failings in other systems. Click the image to learn more about this revolutionary water pitcher that removes fluoride! A Clearly Filtered water pitcher eliminates more than 90% of many heavy metals and fluoride which make drinking water toxic. Carcinogens sneak into every glass of unfiltered water and even a small amount makes its way through ordinary filters. Patented technology at Clearly Filtered removes 90% of fluoride, introduced to water sources when there were concerns about dental health. The Clearly Filtered product for regular household use also gets rid of almost all traces of certain metals such as chromium 6, lead, and mercury plus chlorine. BPA-free, non-leaching plastic is used to make the pitcher so your water will not taste like a plastic bottle. The company publishes a table comparing their filter’s efficiency vs. that of two other unnamed leading competitors. They show contrasts in the amount of contaminants eliminated plus the cost per gallon. This new kid on the block comes out on top in every case where competitors only state that they reduce the amount of certain toxins without providing hard numbers. As far as cost per gallon is concerned, it’s also cheaper at 35 cents per gallon, as opposed to 75 or 83 cents per gallon. 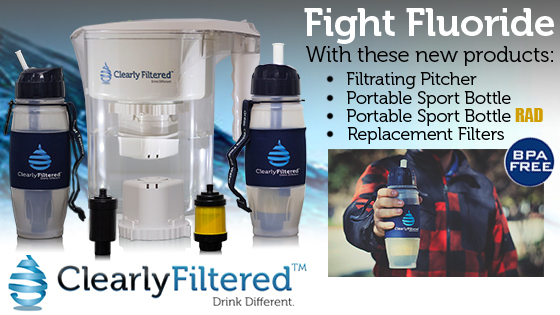 The price of a water pitcher is $69.95 but the Clearly Filtered filter is good for up to 200 gallons which is 5 times that of the closest competitor. Should you trust these findings? Independent studies were ordered so that the people at Clearly Filtered could provide factual evidence to support their claims. Read their background and learn more about the people who run this company. Several of them are athletes. All of them are passionate about what they do.